God was not happy. It had not been very long since he had created the world, and already it was covered in people who sinned all the time and did not care. God had enough. He would destroy the world with a flood. He could have chosen to create new men and women after the flood, but instead he had one man and his family build an ark. Noah took up this challenge. He build an ark for his family and two of every living creature on the earth. He the ark was finished and filled with animals and Noah’s family, God shut the doors, and the rain came pouring down. Everything that was outside of the ark was completely destroyed. It rained for 40 days and 40 nights. The waters covered even the highest mountains. There was water over all the earth for 150 days. Then, God dried up the waters. 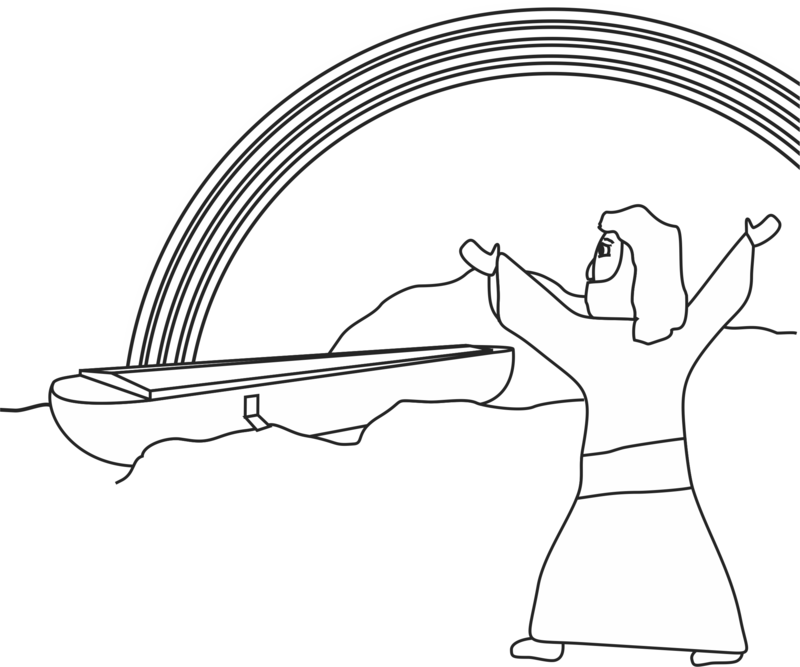 When Noah, his family, and all the animals came out of the ark, God promised he would never flood the earth like this again, and put a rainbow in the sky as a reminder of this promise. This is a great story to have the children help you act out! As you talk about Noah building the ark, have the children pretend they are building (a hammer or sawing motion). When the animals came on the ark two by two, have the children walk in a circle with a buddy, pretending to be different animals. When the rain started coming down, have the children rub their hands together or snap their fingers (If you want it to be a really bad storm, have them clap and stomp to make thunder sounds!) As you allow the children this chance to interact with the story, you are helping to make this very old story something that is more real and present for them. God hates sin. We cannot be with God if we have sin in our lives. That is why God wanted to destroy the world in Noah’s time, because there was so much sin. And, just like Noah and his family needed to be saved from the oncoming flood, we also need to be saved from God’s wrath. Noah had a boat, but we have something much better to save us, Jesus! Jesus can take care of our sin problem forever, so that we can be in a relationship with a holy and perfect God. The Lord said to Noah, "There's gonna be a floody, floody." Lord said to Noah, "There's gonna be a floody, floody." "Get those children out of the muddy, muddy!" Made it out of gopher barky, barky. Nearly drove those animals crazy, crazy. Everything was fine and dandy, dandy. Everything is hunky dory, dory. • God told Noah to bring two of each animal onto the arc. Tell the kids that they will be helping Noah find all the animals he needs to take with him on the arc. • Lay all the cards out on the floor/table, face down. Make sure they are all mixed up. • One at a time, allow the kids to try to find matching animals but picking two cards out of the pile and turning them over. If they find a match, they keep the cards. If they do not find a match, the cards return face down to the pile. • The child with the most animal pairs at the end of the game wins! • Red, blue, and yellow food coloring. 1. Fill each cup with water. 2. Start with taking the red food coloring and putting 2-3 drops in the first cup. Ask the kids what color they see. Ask them to name several things from creation that that are red that God may think of when he sees a rainbow. 3. Repeat step 2 making orange (yellow and red). 1. Have the children trace one of their hands on each color of paper (or trace it for them if they are very young). 2. Cut out each of the colored hands and glue them together, in order (red, yellow, orange, green, blue, purple) in a rainbow-like arc. 1. Cut several strips of aluminum foil and loosely crumple them into ropes small enough to fit into the neck of the water bottle. Twirl them as you insert, so they wind around as they go in. The more strips you put into the bottle, the more surfaces the rice will hit as it goes down. 2. Add a couple of inches of rice and replace the cap on the bottle. 3. Slowly sip the bottle and you will hear the sound of rain as the rice makes its way over the foil and down to the bottle. 4. Allow the children time to decorate their bottles.